BEAVERTON, Ore., Sept. 5, 2018 /PRNewswire/ -- IP networks are the future of broadcasting. Just this month, TV Technology magazine reported "an upturn in momentum behind IP infrastructure deployments" and "expedited…investment plans in IP solutions." The pace of the industry evolution is quickening. As the market moves toward widespread adoption, new tools are needed to ensure the delivery of quality content to viewers. 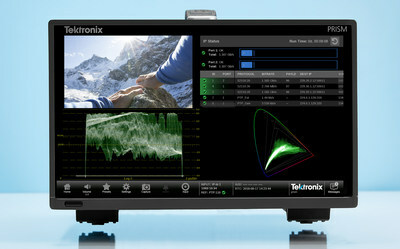 Looking towards the future, new models of the industry-leading Tektronix PRISM now come standard with IP connectivity and a feature set, allowing customers to effortlessly identify the number and content of IP multiple streams, ensure presence of PTP messages, quickly debug IP systems in hybrid environments, and perform quality checks on content. The PRISM also arrives packed with basic editing features like Waveform, Vector, and Diamond. "Tektronix has been an integral part of the first wave of IP system deployments," said Charlie Dunn, General Manager of Tektronix's Video business unit. "We believe that IP is the future of our industry and as a leader in this space, we want to remove the price premium for IP monitoring capabilities to facilitate all-IP system deployment." IP to SDI bridging through the AUX SDI Output – The standard 10GE PRISM comes with the ability to bridge SMPTE ST2022-6/7 or ST2110-20 inputs to an AUX SDI output. This provides the capability to drive external SDI equipment and simplify total system configuration. Identification of streams and content in an IP System - A single 10G ethernet link can carry multiple streams, making it difficult to determine what content is being carried on each stream. PRISM offers a range of tools to quickly identify streams, showing the protocol, source IP address and port number, destination IP address and port number, Source MAC, Destination MAC, PTP Domain, RTP Seq Error, RTP Clock Freq, and RTP Marker Freq of all streams in a 10G link. PTP System Setup Verification – PRISM allows engineers to ensure the settings of the PTP system are correct by displaying the PTP traffic with domain information to check for the presence of PTP messages giving confidence that the PTP system has been deployed correctly. Event Log – Troubleshoot hybrid IP/SDI systems quickly. PRISM offers time-stamped error detection capabilities for both the IP layer and content layers, allowing customers to quickly isolate the root cause of an error and take corrective action. Video Sessions – Instantly check that your video content is correct using familiar tools that show the start of active video, end of active video, bit checks, and CRC errors. IP capabilities are included as standard features in the new models of PRISM: the MPI2 and MPX2 which are available now globally. For more information, go to: tek.com/PRISM.